Imagine getting golfing advice from Tiger Woods (not dating advice). Imagine going to your local batting cage and seeing Tony Gwynn there, offering free tips on hitting. What would you give to get quarterback coaching for your kid from Joe Montana? Suppose opera has always seemed impenetrable to you yet you find yourself wishing you could understand and appreciate it only to have Placido Domingo offer to spend time schooling you on the finer points. 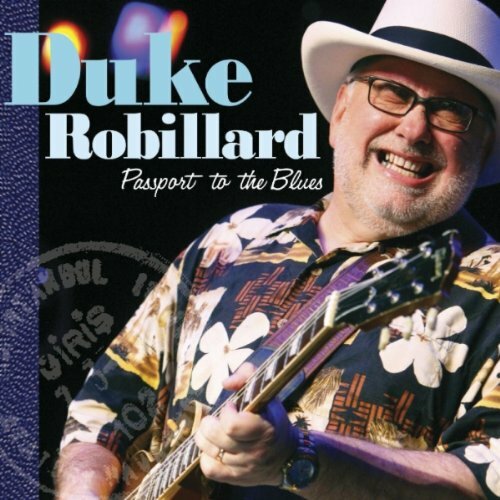 Duke Robillard's Passport To The Blues is an invitation to take a guided tour and see the world of blues through one of the greats. Robillard is a highly respected, versatile guitar player who has largely made his name in blues but who has also explored jazz, swing, and other musical styles. Passport To The Blues is a journey for artist and listener. In the case of Robillard, it's a trip back to the blues after a pair of swing-influenced efforts. It's a pleasure cruise for listeners who get to sit back and enjoy the ride. There are thousands of blues songs about death but how many are as undeniably fun as "Hong Kong Suit?" Robillard is winking and smiling through this number about checking out, aided by some slinky, playful percussion from Mark Teixeira (I'm pleased to report this is not the same Mark Teixeira that plays first base for the New York Yankees) and some honking sax from Doug James. At the center of it all is Duke's guitar, fully in blues mode. "Blues Train" injects some light funk into the mix and Robillard fires off flawlessly executed guitar phrases. "Rhode Island Red Rooster" is a tribute to Howlin' Wolf and his defining rendition of Willie Dixon's "The Red Rooster." It's a nice twist on a venerable classic and gives Robillard an opportunity to summon his inner Hubert Sumlin. He also pays tribute to Tom Waits, with whom he toured, by covering "Make It Rain." I'm not familiar with the Waits version of the song so I can't give you a comparison but Duke plays this one with wicked, nasty, force. "Fatal Heart Attack" sounds comparatively light, musically, but the lyrics are just as serious with the refrain of "you're just about as fun as a fatal heart attack." Versatility can be an albatross for some artists who become wandering spirits who struggle to harness their immense talents to create cohesive artistic statements. For all his travels and explorations of other types of musics and various offshoots of blues, Passport To The Blues proves he isn't bored of playing it straight nor has he forgotten how it's done. I've listened to a lot of Robillard's music and Passport To The Blues is as good as anything he's ever done.